First and foremost a huge thank you to everyone that joined us for the Spring 2016 season. It was truly a great session with teams from across the city joining us in North Houston. We’ve long been excited about the soccer community in Houston and the teams showed such passion this season we’re proud to be part of the soccer scene in H-Town. We’ve only been offering 6v6 Houston Adult Soccer for 6 months know but we already feel like the teams are going to help us build something amazing that no other adult soccer league in Houston can offer with fun on and off the pitch. The Spring season was a tight fought race with United our champions in a tight final win over Red Bulls. Summer season is now underway and we are sold out. We have Men’s & CoEd divisions opened up and we’d like to say thank you to everyone that joined us. The Friday season will be at The British School Of Houston and we’re close to opening up our fall registration. During the fall we’ll have sessions on Wednesdays in West Houston and Tuesdays in South Houston. 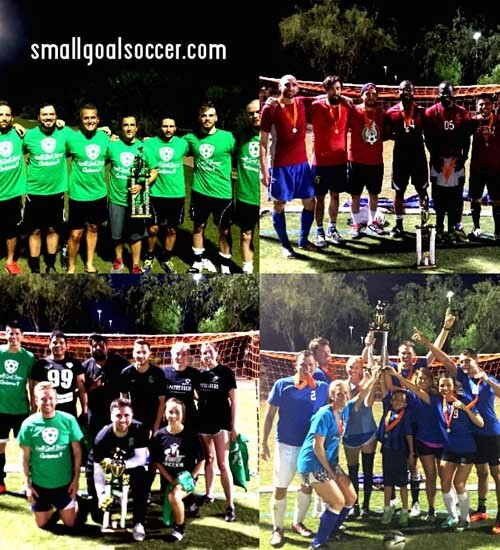 We hope to see you all on the field and reach out with any questions to jay @ small goal soccer .com. We will be accepting full teams but also if you’re looking for a team in Houston Adult Soccer we’ll get you setup. All skill levels welcome.